Thank you for everything you do to support your students to get them ready for the future! Maine‘s economy in the next decades depends on a highly educated workforce, and instilling aspirations for higher education begins at an early age. FAME is encouraging Maine educators to do what they can to help their students, the future faces of Maine, to prepare for higher education. Use the resources below to help the families in your school prepare for higher education. Share posters and brochures with teachers, staff and parents. FAME offers free training for educators that help families prepare for higher education- live and virtual! FAME offers a wide variety of free training opportunities such as webinars and training events for school counselors, college access advisors, financial aid counselors and administrators. Financial Aid 101 (FA 101) is FAME’s annual financial aid training for school counselors, college access advisors, educators and anyone assisting students with the financial aid process. To help prepare for the upcoming financial aid season, FAME will be offering free Summer Financial Aid Training Sessions in August. 2018 summer training sessions have passed. Stay tuned for the 2019 schedule! Helping families learn about financial aid and paying for higher ed. 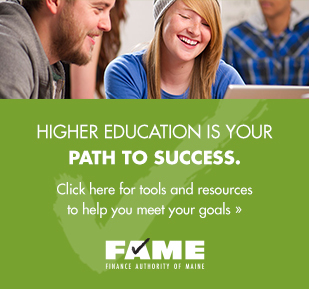 FAME visits schools throughout Maine to offer financial aid nights to help families learn about financial aid and paying for higher education. If you’re interested in learning about how FAME can help your students learn about financial aid, check out this video about FAME Financial Aid Nights. FAME holds In-Person FAFSA Help sessions across the state in October. Follow our 3-step guide: What You Need to File, Filling Out the Form and After You File. FAME's goal is Maine’s goal: By 2030 all Maine families will be saving for higher education & Maine will have one of the lowest student loan debt rates in the nation. We’ll share information about how we can all Invest in ME. Providing contact information is voluntary. Information may be used for FAME education-related communications. You may unsubscribe from future communications at any time. NextGen is a Section 529 plan administered by the Finance Authority of Maine (FAME). Before you invest in NextGen, request a NextGen Program Description from your Merrill Lynch Financial Advisor or Maine Distribution Agent or call Merrill Edge at 1-877-463-9843 and read it carefully. The Program Description contains more complete information, including investment objectives, charges, expenses and risks of investing in NextGen, which you should carefully consider before investing. You also should consider whether you or your designated beneficiary’s home state offers any state tax or other state benefits such as financial aid, scholarship funds, and protection from creditors that are only available for investments in such state’s 529 plan. Merrill Lynch, Pierce, Fenner & Smith Incorporated, a registered broker-dealer, member SIPC, is the program manager and underwriter. Visit the FAQ page for answers to the most common questions. Please contact us at 1.800.228.3734 with any additional questions you might have. By proceeding, you will be leaving NextGenforME.com. You can manage your NextGen 529 account online. Log in to view account statements, request investment changes and distributions and process automated funding contributions. Haven’t set up online account management?Use the link below to start. You will need the account number and Social Security Number of the student (beneficiary). Merrill Edge® is available through Merrill Lynch, Pierce, Fenner & Smith Incorporated (MLPF&S), and consists of the Merrill Edge Advisory Center (investment guidance) and self-directed online investing. MLPF&S is a registered broker-dealer, Member SIPC and a wholly owned subsidiary of Bank of America Corporation. MLPF&S serves as the program manager, underwriter and a distributor of the NextGen plan. Merrill Edge and Merrill Edge Advisory Center are trademarks of Bank of America Corporation. Sign up to make contributions online from checking or savings accounts. Client Select customers can contact their financial advisor for assistance with making contributions. You can manage your NextGen 529 account online. Log in to view account statements, request investment changes and distributions and process automated funding contributions. Haven’t set up online account management? Use the link below to start. You will need the account number and Social Security Number of the student (beneficiary). By proceeding with online enrollment, you will be leaving NextGenforME.com and enrolling in the Client Direct Series through the Merrill Edge® website.